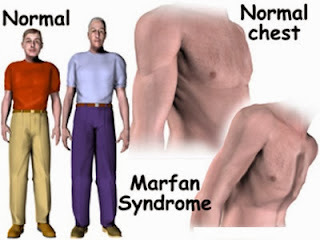 Marfan syndrome is a heritable condition that affects the connective tissue. The primary purpose of connective tissue is to hold the body together and provide a framework for growth and development. In Marfan syndrome, the connective tissue is defective and does not act as it should. Because connective tissue is found throughout the body, Marfan syndrome can affect many body systems, including the skeleton, eyes, heart and blood vessels, nervous system, skin, and lungs. 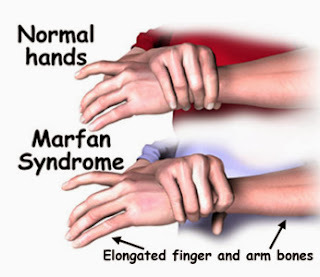 Marfan syndrome affects men, women, and children, and has been found among people of all races and ethnic backgrounds. It is estimated that at least 1 in 5,000 people in the United States have the disorder. Skeleton--People with Marfan syndrome are typically very tall, slender, and loose jointed. Since Marfan syndrome affects the long bones of the skeleton, arms, legs, fingers, and toes may be disproportionately long in relation to the rest of the body. A person with Marfan syndrome often has a long, narrow face, and the roof of the mouth may be arched, causing the teeth to be crowded. Other skeletal abnormalities include a sternum (breastbone) that is either protruding or indented, curvature of the spine (scoliosis), and flat feet. More than half of all people with Marfan syndrome experience dislocation of one or both lenses of the eye. The lens may be slightly higher or lower than normal and may be shifted off to one side. The dislocation may be minimal, or it may be pronounced and obvious. Retinal detachment is a possible serious complication of this disorder. Many people with Marfan syndrome are also nearsighted (myopic), and some can develop early glaucoma (high pressure within the eye) or cataracts (the eye's lens loses its clearness). Most people with Marfan syndrome have abnormalities associated with the heart and blood vessels. The valve between the left chambers of the heart is defective and may be large and floppy, resulting in an abnormal valve motion when the heart beats. In some cases, the valve may leak, creating a "heart murmur," which a doctor can hear with a stethoscope. Small leaks may not cause any symptoms, but larger ones may cause shortness of breath, fatigue, and palpitations (a very fast or irregular heart rate). Because of faulty connective tissue, the wall of the aorta (the large artery that carries blood from the heart to the rest of the body) may be weakened and stretch, a process called aortic dilation. Aortic dilation increases the risk that the aorta will tear (aortic dissection) or rupture, causing serious heart problems or sometimes sudden death. The brain and spinal cord are surrounded by fluid contained by a membrane called the dura, which is composed of connective tissue. As people with Marfan syndrome get older, the dura often weakens and stretches, then begins to weigh on the vertebrae in the lower spine and wear away the bone surrounding the spinal cord. This is called dural ectasia. These changes may cause only mild discomfort or may lead to radiated pain in the abdomen or to pain, numbness, or weakness of the legs. Many people with Marfan syndrome develop stretch marks on their skin, even without any weight change. These stretch marks can occur at any age and pose no health risk. However, people with Marfan syndrome are also at increased risk for developing an abdominal or inguinal hernia where a bulge develops that contains part of the intestines. Although connective tissue abnormalities make the tiny air sacs within the lungs less elastic, people with Marfan syndrome generally do not experience noticeable problems with their lungs. If, however, these tiny air sacs become stretched or swollen, the risk of lung collapse may increase. Rarely, people with Marfan syndrome may have sleep-related breathing disorders such as snoring or sleep apnea (a sleep disorder characterized by brief periods when breathing stops). Marfan syndrome is caused by a defect (mutation) in the gene that determines the structure of fibrillin, a protein that is an important part of connective tissue. A person with Marfan syndrome is born with the disorder, even though it may not be diagnosed until later in life. Although everyone with Marfan syndrome has a defect in the same gene, the mutation is specific to each family and not everyone experiences the same characteristics to the same degree. This is called variable expression, meaning that the defective gene expresses itself in different ways in different people. Scientists do not yet understand why variable expression occurs in people with Marfan syndrome. The defective gene can be inherited: The child of a person who has Marfan syndrome has a 50 percent chance of inheriting the disease. Sometimes a new gene defect occurs during the formation of sperm or egg cells, but two unaffected parents have only a 1 in 10,000 chance of having a child with Marfan syndrome. Possibly 25 percent of cases are due to a spontaneous mutation at the time of conception. The doctor may diagnose Marfan syndrome if the patient has a family history of the disease and there are specific problems in at least two of the body systems known to be affected. For a patient with no family history of the disease, at least three body systems must be affected before a diagnosis is made. Moreover, two of the systems must show clear signs that are relatively specific for Marfan syndrome. In some cases, a genetic analysis may be useful, but such analyses are often time consuming and may not provide any additional helpful information. Family members of a person diagnosed with Marfan syndrome should not assume they are not affected if there is no knowledge that the disorder existed in previous generations of the family. After a clinical diagnosis of a family member, a genetic study might identify the specific mutation for which a test can be performed to determine if other family members are affected. Because a number of body systems may be affected, a person with Marfan syndrome should be cared for by several different types of doctors. A general practitioner or pediatrician may oversee routine health care and refer the patient to specialists such as a cardiologist (a doctor who specializes in heart disorders), an orthopaedist (a doctor who specializes in bones), or an ophthalmologist (a doctor who specializes in eye disorders) as needed. Some people with Marfan syndrome are also treated by a geneticist. There is no cure for Marfan syndrome. To develop one, scientists may have to identify and change the specific gene responsible for the disorder before birth. However, a range of treatment options can minimize and sometimes prevent complications. The appropriate specialists will develop an individualized treatment program; the approach the doctor uses depends on which systems have been affected. Annual evaluations are important to detect any changes in the spine or sternum. This is particularly important in times of rapid growth, such as adolescence. A serious deformity can not only be disfiguring but can also prevent the heart and lungs from functioning properly. In some cases, an orthopedic brace or surgery may be recommended to limit damage and disfigurement. Early, regular eye examinations are key to catching and correcting any vision problems associated with Marfan syndrome. In most cases, eyeglasses or contact lenses can correct the problem, although surgery may be necessary in some cases. Regular checkups and echocardiograms help the doctor evaluate the size of the aorta and the way the heart is working. The earlier a potential problem is identified and treated, the lower the risk of life-threatening complications. Those with heart problems are encouraged to wear a medical alert bracelet and to go to the emergency room if they experience chest, back, or abdominal pain. Some heart valve problems can be managed with drugs such as beta-blockers, which may help decrease stress on the aorta. In other cases, surgery to replace a valve or repair the aorta may be necessary. Surgery should be performed before the aorta reaches a size that puts it at high risk for tear or rupture. Following heart surgery, extreme care must be followed to prevent endocarditis (inflammation of the lining of the heart cavity and valves). Dentists should be alerted to this risk; they are likely to recommend that the patient be prescribed protective medicines before they perform dental work. If dural ectasia (swelling of the covering of the spinal cord) develops, medication may help minimize any associated pain. It is especially important that people with Marfan syndrome not smoke, as they are already at increased risk for lung damage. Any problems with breathing during sleep should be assessed by a doctor. Pregnancy poses a particular concern due to the stress on the body, particularly the heart. A pregnancy should be undertaken only under conditions specified by obstetricians and other specialists familiar with Marfan syndrome and be followed as a high-risk condition. While eating a balanced diet is important for maintaining a healthy lifestyle, no vitamin or dietary supplement has been shown to help slow, cure, or prevent Marfan syndrome. How Does Marfan Sydrome Affect Lifestyle Choices? Most people with Marfan syndrome can participate in certain types of physical and/or recreational activities. Those with dilation of the aorta will be asked to avoid high intensity team sports, contact sports, and isometric exercises (such as weight lifting). Ask your cardiologist about activity guidelines for you. Genetic counseling should be performed prior to pregnancy because Marfan syndrome is an inherited condition. Pregnant women with Marfan syndrome are also considered high-risk cases. If the aorta is normal size, the risk for dissection is lower, but not absent. Those with even slight enlargement are at higher risk and the stress of pregnancy may cause more rapid dilation. Careful follow-up, with frequent blood pressure checks and monthly echocardiograms is required during pregnancy. If there is rapid enlargement or aortic regurgitation, bed rest may be required. Your doctor will discuss with you the best method of delivery with you. People with Marfan syndrome who have heart or valve involvement or who have had heart surgery are at increased risk for bacterial endocarditis. This is an infection of the heart valves or tissue which occurs when bacteria enters the blood stream. To prevent this, antibiotics may be needed prior to dental or surgical procedures. Ask your doctor whether you need antibiotics, and if so, how much and what kind should be taken. A wallet card may be obtained from the American Heart Association with specific antibiotic guidelines. Learning you have Marfan syndrome may cause you to feel angry, frightened or sad. You may need to make changes in your lifestyle and adjust to having careful medical follow-up the rest of your life. You may have financial concerns. You also need to consider the risk to your future children. The National Marfan Foundation can provide support. The parents and siblings of a child diagnosed with Marfan syndrome may feel sadness, anger, and guilt. It is important for parents to know that nothing that they did caused the fibrillin gene to mutate. Parents may be concerned about the genetic implications for siblings or have questions about the risk to future children. Some children with Marfan syndrome are advised to restrict their activities. This may require a lifestyle adjustment that may be hard for a child to understand or accept. For both children and adults, appropriate medical care, accurate information, and social support are key to living with the disease. Genetic counseling may also be helpful in understanding the disease and its potential impact on future generations. What Is the Outlook for a Person With Marfan Syndrome? While Marfan syndrome is a lifelong disorder, the outlook has improved in recent years. Early diagnosis and advances in medical technology have improved the quality of life for people with Marfan syndrome and lengthened their lifespan. In addition, early identification of risk factors (such as aortic dilation) allows doctors to intervene and prevent or delay complications. Advances being made by researchers provide hope for the future. With early diagnosis and appropriate management, the life expectancy for someone with Marfan syndrome is similar to that of the average person. What Research Is Being Conducted To Help People With Marfan Syndrome? Scientists are approaching research on Marfan syndrome from a variety of perspectives. One approach is to better understand what happens once the genetic defect or mutation occurs. How does it change the way connective tissue develops and functions in the body? Why are people with Marfan syndrome affected differently? Scientists are searching for the answers to these questions both by studying the genes themselves and by studying large family groups affected by the disease. Newly developed mouse models that carry mutations in the fibrillin gene may help scientists better understand the disorder. Animal studies that are preliminary to gene therapy are also under way. Other scientists are focusing on ways to treat some of the complications that arise in people with Marfan syndrome. Clinical studies are being conducted to evaluate the usefulness of certain medications in preventing or reducing problems with the aorta. Researchers are also working to develop new surgical procedures to help improve the cardiac health of people with Marfan syndrome. Patients who have Marfan Syndrome have witnessed a dramatic rise in their life expectancy. According to the research papers by the American Journal of Cardiology (January 1995), there has been a 25 percent increase in life expectancy since 1972. The study shows that the average life expectancy of Marfan Syndrome patients has increased from 41 to 70 years for men and from 49 years to 74 for women. Marfan syndrome life expectancy may be different from patient to patient. There is no treatment for the Marfan syndrome, but life expectancy may be influenced by monitoring and treatment of complications that can occur. Marfan syndrome life expectancy increased lately because of the advancement in medical techniques and appearance of new treatments. Best way to expend Marfan syndrome life expectancy is tracking the aneurysm of the aorta and mitral valve prolapse. This is done by a cardiologist annual control for monitoring the health of the heart valves and the aorta. This is done by performing an ECG or another radiological method for the visualization of the anomaly (such as CT or MRI image). The goal of treatment in Marfan syndrome is to slow the progression of the aortic dilatation and to prevent the dissection of the aorta. Another goal of the treatment is to eliminate arrythmias and diminuate the heart rate. The skeletal manifestations of this syndrome are also important for Marfan syndrome life expectancy. They can be serious and can affect patients life. To solve these problems are used different kinds of pain medication or muscle relaxants. Because some of the Marfan symptoms of the spine may be asymptomatic, but serious if are not treated, they can be solved by surgery and thus increase the Marfan syndrome life expectancy. Lung damage involves spontaneous pneumothorax and Marfan syndrome life expectancy depends on the volume of air in the pleural space. It may resolve by itself or can be made by chest drainage.